There comes a time when you stop working for your money and put your money to work for you. For most people, that is retirement. The decisions you make then could have repercussions for the rest of your life, and in recent years there have been some major changes to the retirement choices you can make with your pensions. This guide will help you understand the key issues and decisions that will affect your income after retirement. 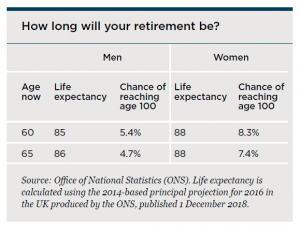 Your retirement could turn out to last considerably longer than you think, as the table below shows. You probably have several different investments and other assets that can provide income in your retirement, and that you may perhaps also wish to leave to your family. There could be different pensions from different sources. You are likely to have a state pension and other pension entitlements that have built up over the years, perhaps from several employers. You may also have savings and investments you have accumulated over your working life or from inheritances. You probably also own your home, which may now be larger than you really need, and you could possibly use some of its value to boost your retirement income. Your income needs may also evolve as you grow older. For example, in the early years of retirement you may be happy to continue working part-time and so may need to draw less than the full potential income from your pensions and other investments for a while. Or your income needs could start relatively high and then reduce as you get older, before rising again. This could happen if you have an active but non-working early retirement with relatively high-income needs. These may fall as you get out and about less, before increasing again if it turns out that you need care. You may also have to deal with unexpected events, such as illness or an accident, which could affect your ability to work, or lead you to need more income at short notice. The decisions you make when you retire should take these possibilities into account. You might also want to consider how to minimise the inheritance tax (IHT) on your estate. Planning point – Your retirement plan will evolve over time, as your circumstances change, so you should make sure your plan allows for various outcomes. Some decisions you take for your retirement may be permanent, for example, if you decide to buy an annuity. Others, like the investment of a retirement lump sum, may need to be regularly reviewed. Making the right investment choices at retirement is so important that you owe it to yourself and your family to take planning seriously. It is best to start long before your intended retirement date, because gathering all the relevant information and weighing the various options can be a slow process. In this guide, the focus is on private pension provision, which for many people will be their primary source of retirement income. The scope for drawing pension benefits has changed significantly in the past few years, giving greater flexibility and a correspondingly increased need for advice. Your attitude to investment risk and ability to absorb losses will probably change once you have no earnings with which to cover any investment losses. Your marginal rate of tax could fall when you stop work, as your full-time earnings come to a halt. You may not be certain about the level of your future income if, for example, you are planning to undertake some part-time consultancy work. You may want to pay more attention to inheritance planning than you have before. Your spending patterns are likely to change with no travel to work, and more leisure. A good starting point is to estimate what net income you will need in retirement by undertaking a long-term, cash-flow planning exercise. This cash-flow planning exercise will take into account how long you may live, based on anticipated lifespans, and also your own health and family history. Planning point – It is important to have a clear idea of your investment and income goals so you can make a savings plan that gets you there. A defined contribution (DC) pension will typically be either a scheme set up by or on behalf of an employer, or a personal or stakeholder pension you set up yourself. The DC scheme has a fund, 25% of which you can draw as a tax- free lump sum. The remainder is taxable, whether taken as income or as further lump sums. A defined benefit (DB) scheme offered by an employer (past or present) will provide you with a pension that is based on your earnings and how long you have worked for the relevant It could also pay you a tax-free lump sum, usually in return for a reduced pension. DB schemes used to be widespread, but spiralling costs have led to many schemes being closed and replaced with DC schemes. These two different pension types generally offer very different levels of flexibility. Within a DB scheme, you may have just one simple choice to make: do you want to exchange some of your taxable pension for tax-free cash? You may not be able to defer taking your benefits if you have stopped work and reached the scheme’s retirement age. If you are below that age, you have more options, including the possibility (mainly outside the public sector) of a transfer to a DC pension. In contrast to DB arrangements, DC schemes can, in theory, offer extensive flexibility. In practice, much will depend upon the individual scheme: it is a fact of pensions that there can often be a large gap between what the legislation permits and what the scheme provider will allow. This is especially the case with older pension arrangements, although again the option of a transfer to a new pension will be available, which could then provide more flexibility. Will you lose any valuable benefits if you switch provider? For example, some old retirement annuities (the predecessors of personal pensions) incorporated guaranteed annuity rates which are far higher than those available in today’s market Similarly, you may lose bonuses if you transfer before a plan’s maturity date. What investment funds are available? If your new plan is a self-invested personal pension (SIPP), you could have an almost unlimited choice, but this may not be necessary to meet your objectives. How do charges compare? A switch will involve fees and ongoing charges in your new arrangement. These need to be considered against the costs and lost flexibility that come with making no change. If a transfer is considered from a DB arrangement to a DC pension, a new, much greater level of complexity is introduced into the comparison, not least because you would be giving up safeguarded benefits. If you are retiring abroad, the possibility of transferring your pensions to an HMRC-recognised offshore pension arrangement also needs to be reviewed. Unsurprisingly, this is a highly specialist field where advice is essential. The decision on whether to transfer is partly related to the next major decision: what you do with your pensions in retirement. Planning point – If you are considering flexible drawdown you should consider taking advice to make sure your plan will provide enough income throughout your retirement. This may seem an unusual option to contemplate at retirement, but for DC schemes it could be worth considering if you have other means to support yourself, at least in the initial years. For example, you could draw capital and income from your non-pension investments while leaving your pension investments undrawn. Within a pension, investment returns are generally free of UK income tax and capital gains tax (CGT). Payments on death from pensions, whether as a lump sum or income, are generally free of IHT and, if you die before age 75, usually free of income tax. Income tax is only paid when you draw funds from your Postponing drawing benefits might help to reduce the income tax payable. This could be particularly relevant if you have high earned income, e.g. from bonuses, in the tax year that you cease work or are phasing in your retirement. Many DC pensions will allow you to defer drawing benefits indefinitely, but some old arrangements have an upper age limit, typically 75. Such restrictions can usually be overcome by making a transfer before the age ceiling is reached, though you need to be aware that all death benefits after age 75 are taxable, so the benefit of the tax-free cash lump sum is lost if it has not been taken. For some wealthy individuals, the changes to the treatment of pension death benefits since 2014 have meant making a deliberate estate planning decision to leave their pensions untouched until death. Convert (technically ’commute‘) part of your pension into a tax-free lump sum and receive a lower pension income. 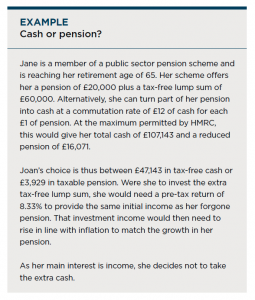 In many public sector schemes, the cash-and-pension combination is automatic and the choice is limited to converting part of the pension to bring the total cash up to the maximum permitted by HMRC. If your DB scheme gives you the choice of trading pension income for a lump sum, even though it is tax free, cash may not be the best option. The terms on which you will be able to exchange some of your pension for cash are often far from generous and may more than offset the tax exemption. The fund built up in a DC pension plan effectively gives you a pot of money, and your cash options are somewhat different. You can use your fund to provide a tax-free lump sum, usually up to 25% of the total fund. If you choose to take the maximum tax-free lump sum, the remainder of your fund will be taxable when you draw on it, whether by regular or one-off withdrawals or via an annuity purchase. However, with the right structure of benefits, there is no requirement to start taking an income when you draw your tax-free cash. Subject to your scheme’s rules, you do not have to draw all your tax-free cash at once and there can be advantages in crystallising your pension fund gradually, effectively drawing tax-free cash each time you initiate new benefits. Planning point – Taking a tax-free lump sum may sound tempting, but you should make sure you understand the risks involved, and how a withdrawal may affect your future income. The complexity and risk factors mean that drawdown is not suitable for everyone and should only be considered after taking advice. Drawing income will restrict future contributions to DC pensions without incurring tax charges, except for ‘capped’ drawdown arrangements started before 6 April 2015. The money purchase annual allowance (MPAA) for DC pension contributions in such circumstances is just £4,000. Any fund left over when you die while taking drawdown income can be used to provide a pension for a dependant or someone else nominated by you, or paid out as a lump sum. In either case, payments are tax free if you die before age 75, but taxable if you are 75 or over. Whatever you do, you should consider the tax consequences. Drawing down a very substantial amount from your fund could cause more of your income to be subject to higher rates of tax than if you drew smaller amounts each year. Or you might be able to adjust your income from other sources so that you can take a substantial amount from your pension without an especially high tax charge. It is an area where professional advice can be beneficial. An alternative to extracting tax-free cash and beginning flexible income withdrawals is to take advantage of the uncrystallised funds pension lump sum (UFPLS) rules for DC schemes. An UFPLS allows you to withdraw money from your pension, up to its full value, without needing to use income drawdown or buy an annuity. With an UFPLS, 25% will be tax free, while the remainder is taxed as income. A series of UFPLS withdrawals could be used to provide a tax-efficient income, but this route is generally not available on an automatic basis. A large amount of taxable income could take you into a higher income tax bracket. Once you draw an UFPLS, your future payments to DC pensions without tax charges are restricted to the MPAA level of £4,000. Investing for income outside the pension framework may be less tax-efficient than retaining that framework for your investments. The IHT advantages of pensions are lost, as the lump sum or any subsequent investment will form part of your taxable estate. for occupational schemes, any encashment must cover all your benefits under the scheme. A similar option, trivial commutation, exists for occupational defined benefit schemes. The rules are subtly different and the value limit is £30,000. In some circumstances using these rules could allow you to defer drawing on your main pension arrangement(s). Before the introduction of flexible income withdrawals, the most common way of providing an income from a DC pension, once cash had been taken, was to use the remaining funds to buy an annuity from an insurance company. At its simplest, an annuity offers a guaranteed income for life, something which income drawdown and fund withdrawals do not and cannot provide. The income payment depends on many factors, including the available funds, interest rates, your age and your health. For many people, particularly those with little other income to fall back on in retirement, that guarantee is a crucial factor favouring annuity purchase. The form of annuity. Your annuity income could stay at the same level for the rest of your life or you could opt for a lower starting income that increases each year to protect you against the effects of inflation. You could also choose for income to be paid to your spouse, partner or anyone else you choose, perhaps for a guaranteed period or at a lower level than your pension, if you die before them. If you are under age 75 when you die, it is tax free. The annuity provider. Never automatically buy the annuity offered by your current pension provider – the chances are that you could do better. There are substantial differences in annuity rates offered by the top and bottom companies, and they change frequently. You may also qualify for an enhanced annuity because of your health or other circumstances. Remember, an annuity purchase is a decision for life and cannot be changed: the price of the lifetime guarantee is a near complete lack of flexibility. There is no substitute for skilled advice from an expert who can check the whole market for you before you make any decision to buy an annuity. Planning point – whilst less popular than they used to be, annuities provide a way for you to secure an income for the rest of your life, without having to manage any investments or drawdown arrangements. Use part of your pension fund to give yourself a tax-free lump sum and buy an annuity to provide you with a baseline guaranteed income. Place most of the remainder into flexible income drawdown to top up your annuity income. Leave the residual amount of your pension untouched, so that it can be used to supply one-off UFPLS lump sums when needed. Levels and basis of, and reliefs from, taxation are subject to change and depend on your individual circumstances. Choosing between annuity and flexible income drawdown. Helping you tailor your pension income strategy to meet your needs. Where applicable, identifying the appropriate provider, investment strategy and income levels for flexible income drawdown. Managing your investments, including the pension lump sum, in a tax-efficient way that meets your needs. This publication is for general information only and is not intended to be advice to any specific person. You are recommended to seek competent professional advice before taking or refraining from taking any action on the basis of the contents of this publication. The Financial Conduct Authority (FCA) does not regulate tax advice, so it is outside the investment protection rules of the Financial Services and Markets Act and the Financial Services Compensation Scheme. This publication represents our understanding of law and HM Revenue & Customs practice as at 12 November 2018 and the proposals in the Autumn 2018 Budget.